Bozeman, Mont. (December 14, 2015)—The recipients of the 2016 Mugs Stump Award were announced by Chris Van Leuven, Alpinist's Digital Editor, at the Bozeman Ice Festival on Wednesday, December 9. The award, a collaborative effort of Alpinist Magazine, Black Diamond Equipment, Ltd., Mountain Gear, Patagonia, Inc., and W.L. 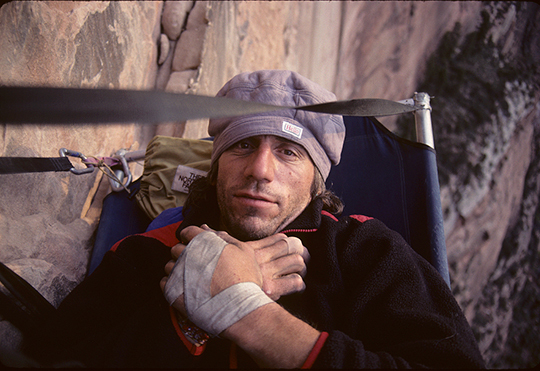 Gore & Associates, Inc., was created in 1993 in memory of Mugs Stump, one of North America's most visionary climbers. In the 24 years since its inception, the Mugs Stump Award has provided over $400,000 in grants to small teams pursuing climbing objectives that exemplify light, fast and clean alpinism. "It's exciting to look through each year's applications for the Mugs Stump Award," said Michael Kennedy, one of the grant's founders. "These climbers are getting after it and finding hidden gems all over the world." Seven teams with outstanding talent and objectives received a total of $36,000 in grants. * Revelation Mountains, Alaska. Chris Thomas and Rick Vance will return to the remote Revelation Mountains, in the southwest corner of the Alaska Range, to attempt new routes on Jezebel and Pyramid. "Our 2015 trip (supported by a Mugs Stump Award) opened our eyes to the enormous potential in this raw and unspoiled place," says Thomas. "The peaks are guarded by absolutely heinous weather, difficult access, and objective hazards that must be carefully negotiated. It's Alaskan exploration and alpinism at its finest." * Kichatna Spire, Alaska. Ben Erdmann and Jess Roskelley will revisit the stormy Kichatnas in hopes of finding good early-season conditions on the South Face of Kichatna Spire. "The upper headwall will require very technical rock trickery after climbing ice and mixed terrain for 4,000 feet," says Erdmann. "The approach alone will be full value with landing far down glacier and skiing up to establish our basecamp." The pair has previously established three new routes in the area. * Middle Triple Peak, Alaska. Kevin Cooper and Ryan Jennings will also visit the Kichatnas in search of a full-value experience on the West Face of Middle Triple Peak. "We prefer to pack as much fun and suffering as possible into each day in the hills," says Jennings. "We have always returned to hard mixed climbing as our true calling, and hope to combine this with aid and free climbing to connect systems up Middle Triple Peak." * Brahmasar II and The Fortress, Garhwal Himalaya, India. The Garhwal, with reasonable access and a long climbing history, still has its unexplored corners. Alison Criscitiello and Anna Smith will journey to one of those to attempt the unclimbed Brahmasar II, and if time allows, The Fortress. "Our overall intent is to mount an expedition in the simplest manner possible," says Criscitiello. "It is the experience of wild adventure and accomplishment that remains the most valuable objective of any project." * Arjuna, Kishtwar National Park, India. The Kishtwar region, recently reopened to climbers after a 20-year hiatus, is still relatively unexplored. Chris Gibisch and Jeff Shapiro will attempt the west face of Arjuna, one of many tempting objectives in the area. "To us the beauty of exploration holds more importance than success or failure," say Gibisch. "It is about the chance to experience the unknown, whether it is physical geography or within ourselves." * Ultar Sar, Karakorum Himalaya, Pakistan. Jed Brown and Colin Haley will return to the southeast pillar of Ultar Sar, which they attempted in 2007. "The route is massive, with at least 3200 meters of elevation gain," says Brown. "There is no walking terrain on the route and we expect sustained mixed climbing above 6000 meters, likely with greatest difficulties occurring above 7000 meters." The peak itself has seen only two ascents, both in 1996. * Shispare Sar, Karakorum Himalaya, Pakistan. After three years of bureaucratic wrangling to get their peak permit, veteran alpinists Doug Chabot, Steve Su and Rusty Willis will journey to the Karakoram in pursuit of "the most promising untried line" Chabot says he's ever laid eyes on. Shispare Sar has seen two previous ascents, in 1975 and 1995; both were aided by more than 1000 meters of fixed rope. Chabot, Su and Willis plan to climb the north face in alpine style, without fixed ropes or fixed camps. These climbers—and all of this year's Mugs Stump Award applicants—share Mugs' vision of climbing as a celebration of boldness, purity and simplicity. For more information on the Mugs Stump Award, including reports from previous years, please visit mugsstumpaward.com.